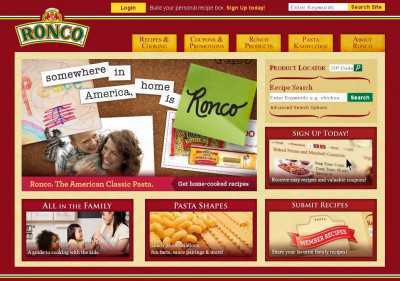 The American Italian Pasta Company (AIPC) created this website to give its many customers a place where they could learn how to cook pasta like a pro, without having to ask a single question themselves. MakesAMeal.com brings together recipes, tips and videos that can be accessed using a simple interface, and anything that you find (and like) on this site can be shared with all your friends. 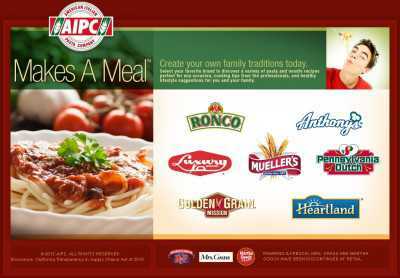 The way this site works, on MakesAMeal.com you can pick your favorite AIPC brand to be taken straight to a page that is devoted solely to it. Which is just great, as you won’t have to sort recipes and tips later. All the content you will see is going to relate to the brand you have chosen at the start of the whole process. If you want to see recipes for other brand, then it’s going to be a simple question of heading to the homepage again, and picking the one that applies. Currently, all of the brands manufactured and distributed by the AIPC are included there. The logos of Ronco, Anthony’s, Luxury, Mueller’s, Pennsylvania Dutch, Golden Grain and Heartland are all made available, for you to click on the one that’s already your favorite. Or that you want to learn appreciate better, of course. That’s one of the points of MakesAMeal.com – to let you approach your pasta from a whole new angle. And by coupling tips that come straight from the mouths of experts with so much interesting media, this aim is more than fulfilled.